Riley 9 Lynx tourer bought from Motor Mart Ltd, of London W1. Homepage. This page: A vintage MG saloon is part-exchanged for an open-top Riley. Motor Mart Ltd, Great Portland Street. Mr Brooks was something of a car enthusiast it seems. Various items of paperwork now on the site refer to cars he bought throughout the 1930s. One, for example, raised by Cass's Motor Mart, refers to a used 18hp MG saloon against which an old Crossley had been part-exchanged. That invoice dates to 1936. 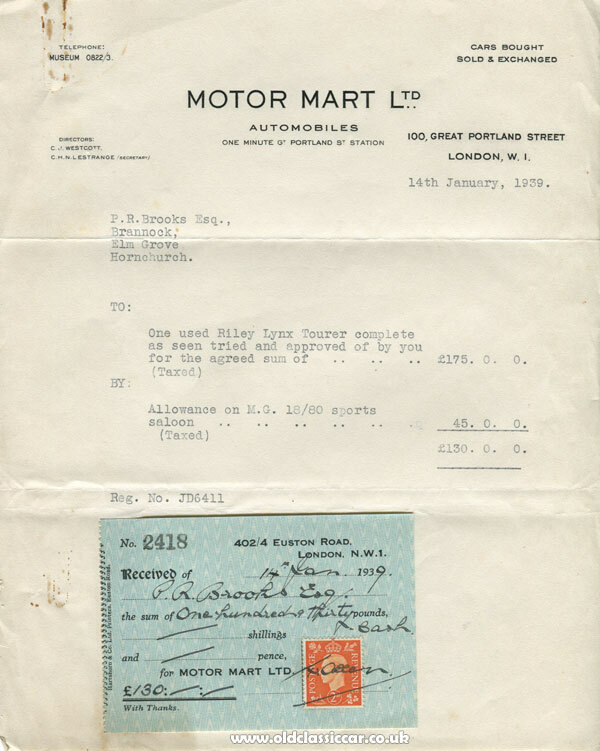 Here, in January 1939, an invoice raised by Motor Mart Limited, of 100 Great Portland Street in London, W1, records Mr Brooks exchanging an MG 18/80 Sports Saloon for a "tried and approved" Riley Lynx Tourer, for which 175 GBP was being asked. Against this, 45 GBP was deducted for the MG. The Riley's registration number was JD 6411. Earlier papers record Mr Brooks' home address as being on Butts Green Road in Hornchurch, yet by 1939 he had moved to Brannock, Elm Grove, in the same town. He paid the bill in full, cash, on the same day the invoice was raised, 14th January 1939. Streetview confirms that the location of the garage, 100 Great Portland Street, survived the war intact and while I'm sure it has seen some re-modelling over the years, it is quite easy to see how at one time this was a car sales establishment. Whether the Riley 9 also saw out the war unscathed isn't currently known. What vehicles, if any, Mr Brooks bought after the war aren't documented in the collection of papers I found. Accompanying the papers are several copies of the Alvis Owners Club magazine, dating to the 1960s, so perhaps he maintained his interest in quality British cars for many more years after buying the Riley.